If you belong to Swagbucks you’ll want to check out the Special Offers Tab right now. 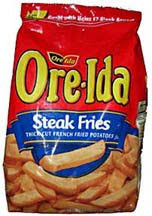 There is a coupon link for $1.50/2 Ore Ida Potato Products. If you don’t yet belong to Swagbucks, you can sign up right now and start earning points towards free items! Note that I actually had to go through the No Obligation Special Offers twice before I had this one come up. But, in the process I earned some Swagbucks!